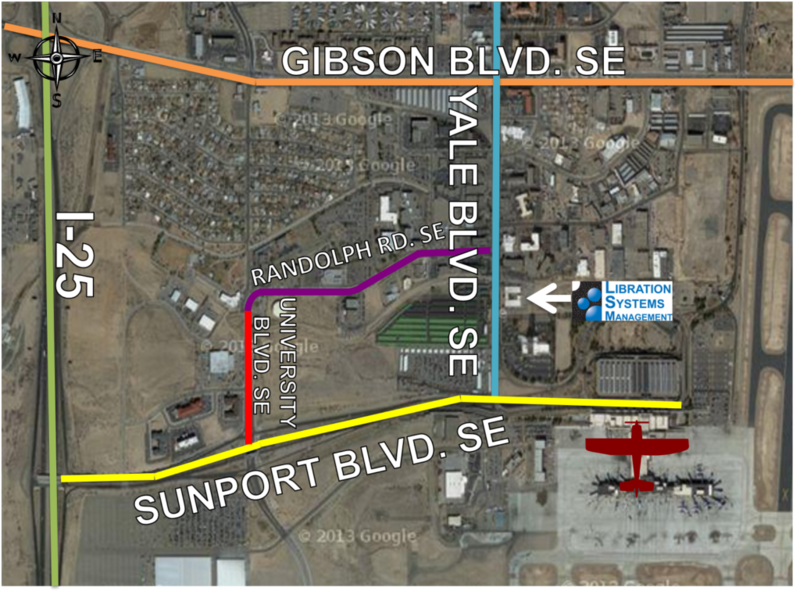 Albuquerque Directions & Map | Libration Systems Management, Inc. Turn north (right) on University Blvd. University will become Randolph road follow Randolph road east (right) to Yale Blvd. Turn south (right) onto Yale Blvd. and make a U-Turn on your second left, then take an immediate right into the parking lot. We are before (north of) the Sheraton Albuquerque Airport Hotel. Take exit 222, Gibson Blvd East (towards the mountains). Turn right on Yale Blvd. once you pass Randolph Road make a U-Turn on your second left, then take an immediate right into the parking lot. We are before (north of) the Sheraton Albuquerque Airport Hotel.